Akit's Complaint Department: Clipper Pass Accumulator - Could it Work on Bay Area's Transit? Clipper Pass Accumulator - Could it Work on Bay Area's Transit? It's that time in the month again to buy those transit passes, from the Muni Fast Pass to that Caltrain monthly pass. For those who commutes on a regular basis, you already know the savings you get by riding literally every single day round-trip. But how about those occasional passengers who frequently either just make it over the savings barrier or comes out in a loss? I have that issue myself, I commute half-time on Muni while the other half is spent driving (usually to get groceries and grab dinner after work). Crunching the numbers shows that I hardly ever make the savings barrier, and the only times I do so is if I take the Cable Cars a few times during the month. For those who don't ride enough to make-up the value of a pass, it's simply just paying cash for their transit rides. 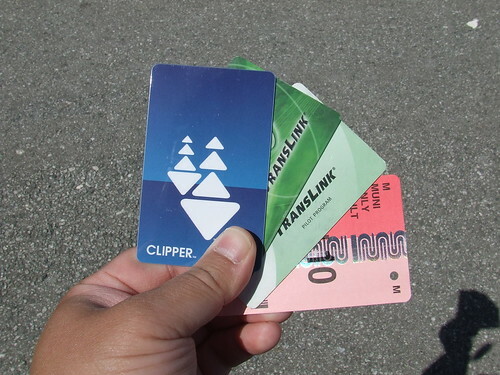 Could the future of the Clipper card involve the idea of a "pass accumulator" program? I mentioned this before from reviewing meeting notes posted online from the MTC that the consortium wants to consider this type of idea. The passenger uses their e-cash purse, just like paying dollar bills and coins for a single ride. When the e-cash transactions reaches a certain threshold within a specified period (e.g. calendar month), future rides is not deducted from the e-cash purse (free ride), thereby the passenger 'earned' the pass. Once the specified period ends, the system starts all over again. Sure, it sounds really simple: Spend enough, and get the rest of the rides free. There are some pros and cons to the pass accumulator. Many of the pros are for the consumer while the cons are all from the transit agencies. Passengers do not have to pre-purchase passes anymore, they just add e-cash as needed. Passengers don't have to think if a buying a pass is worth the value or not. Mid to light use passengers will prefer to pay in Clipper e-cash funds because they know they can't spend more than a certain amount within a certain period. Faster boarding of vehicles because more are using the Clipper card than paying cash (as per #3). This also means a faster ride. Less usage of the cash/change fareboxes means less maintenance on the equipment and less people needed to count cash and change (savings for transit agency). Transit agencies could argue that they make more money off those passengers who buy passes and do not make-up for its value. Unions can argue that their farebox maintenance and cash counting jobs will disappear because of the dominance of electronic transactions. Not all transit agencies will cooperate, mainly because they don't sell passes (Golden Gate Transit & Ferry and BART) or their passes are incompatible with the concept (AC Transit's 31 day pass). Akit's take: I believe transit agencies should accept the pass accumulator program, and especially Muni. Muni operates slow, and runs frequently late. If Muni accepts the pass accumulator program, more will use the Clipper card to pay. For the time it takes to insert two one dollar bills into a machine and get a transfer, at least three Clipper cardholders can complete their transactions. What's your view about pass accumulation? Do you think this can work? Would be nice but those passes do provide some up-front cash for Muni and might make projections of the fare revenue stream more or less accurate. What I rather would like to see are quarterly passes and 6 months passes, heck even annual passes at a decent discount - all on the Clipper card of course. I was just thinking about your claim that 31 day passes and pass accumulators are incompatible. That claim is incorrect. At every transaction check if the rider has paid the equivalent of a 31-day pass in the last 31 days. Charge them only up to that number. It's a little different than the monthly pass accumulator where once the rider reaches the monthly limit, for the rest of the month they don't pay more. Under the 31-day rolling period logic, the rider may pay a little bit every day to keep their expense in line with the cost of a 31-day pass. If they use their pass uniformly every day, then every day they will simply pay 1/31 of the cost of the pass. If they skip a day, then every other day they will pay 2/31. In fact, this can be generalized to 7-day and 24-hour passes with increasing cost-effectiveness to the rider the longer the period they ride for. The benefit for the agencies is a constant stream of income, where the cost of the pass is simply amortized over the time period. It is also better for the rider in that it doesn't matter when they first start using the system, and they don't have to wait it out till the end of the month to start using it. The A pass can also be generalized for shorter time periods such as $7 for 24 hours, and $30 for 7 days. I think that more innovative ways of buying fares would help spur new transit ridership. A pass accumulator is a good idea, as are another commenter's suggestion of having a month pass begin on any given day in the month (ie. from 6/15 through 7/14). I also wish that Muni would (again) offer weekly passes (or, even better, a seven day pass that can be activated on any given day and not necessarily only at the start of the week). More fare options would make the system more attractive for more riders and potential riders. Just wanted to mention that VTA's clipper implementation uses an accumulator for day passes.